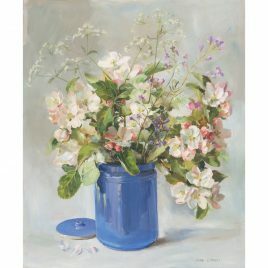 Anne Cotterill was born in the Borders of Scotland, educated in Edinburgh and graduated from Edinburgh College of Art in 1956 at the time when Sir William Gillies was head of painting. She was awarded a postgraduate scholarship which was followed by a travelling scholarship to Europe that enabled her to study the work and technique of the great traditional painters. 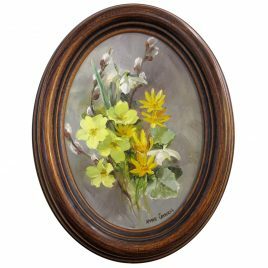 In the early 1960s she moved to Somerset, where the seasonal changes of the wildflowers were a constant source of inspiration. Her detailed understanding of botany was combined with a focus on light and texture that gives her work great presence. She worked entirely in oils. 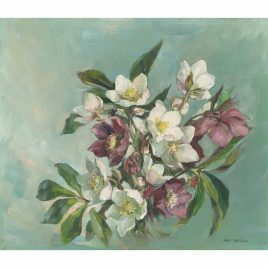 Anne Cotterill had many successful exhibitions of her work, including solo exhibitions at Thompson’s Gallery, regular collections at the Wykeham Gallery, the Napier Gallery, Thompson’s Gallery, the City Gallery, and the Bellflower Gallery. Exhibitions of Anne’s paintings always attract queues of enthusiastic collectors and demand for her originals far outstrips supply. Anne’s last solo exhibition took place at Forde Abbey, Somerset in September 2009. Her work is featured in many classic Art Publications. Together with her daughter Catherine, Anne established Mill House Fine Art Publishing Ltd which specialises in faithful reproductions of her work, both as limited edition prints and greetings cards. 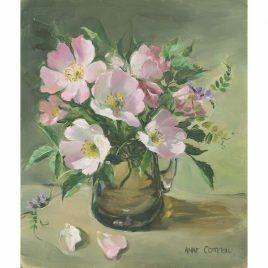 Very sadly Anne Cotterill died in August 2010.